Australia's leading 457 visa resource comparing key services from 457 visa health insurance to bank accounts. First established in 1954, the Health Insurance Fund of Australia offers health cover to Australian residents and HIF 457 visa health insurance for working visitors. The fund’s 457 Visa Health Insurance range is DIBP compliant (meet’s the government condition 8501 requirements) and policy holders receive a 4% discount when paying annually. HIF comes in fourth with regard to affordability and savings for visitors. HIF 457 visa health insurance starts at $88.42 for single visitors, but this health insurance also offers amazing flexibility for many 457 visa holders who want extras and more personalised treatment services. One of the key reasons that HIF 457 visa health insurance price is so competitive is because the fund is ‘not for profit’. This means that the Australian health fund doesn’t need to achieve profits for shareholders. Any surplus is therefore used to keep Australian health cover prices low or to increase benefits. Visitors will find that our 457 health insurance comparison table highlights, Frank as the second cheapest health insurance despite HIF having the overall, smallest increase for the second year in a row. It is therefore critical to understand why HIF may be the superior value for visitors. Let’s look at some of the features HIF provides to policy holders. HIF does not charge an excess for hospital visits. Several other funds charge the first $300 to $500 in costs when you visit a hospital. This is not the case for HIF 457 visa health insurance as long as your stay is within a public hospital in a shared room. HIF members who hold Comprehensive Working Visa cover may choose to apply for an $500 optional excess if they wish. This will help to reduce their policy premiums further. When you are admitted to hospital you will be provided with full cover to the charge of the MBS scheduled amount. This includes doctor’s bills in the hospital at the PBS rate and Pharmaceutical Drugs on the PBS. There are also no co-payments which is another cost some funds charge for every additional day you remain within a hospital. Unlike other Australian health funds offering 457 health insurance, HIF allows policy holders to mix and match hospitals + extras. 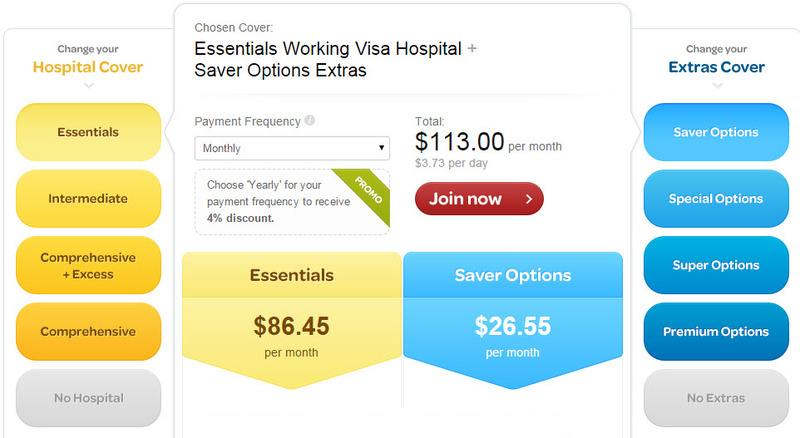 The screenshot below for example shows how you can match essential hospital cover with their savers extras cover option. This essentially means that you can have the compulsory hospital cover plus elements you will more regularly claim on such as dental and optical (included in extras cover). HIF has some of the strongest reviews in Australia and is a well known brand. This includes reviews directly relating to their overseas visitor health cover including the HIF 457 visa health insurance policies. On Productreview.com.au the Australian health fund scored 66% based on 52 reviews (17/07/2016). This is higher then many other ‘for profit’ funds such as Medibank and Australian unity. With HIF offering such a cheap 457 health insurance policy price at entry level, it’s no surprise that they don’t offer private hospital cover. Their Intermediate cover policy and comprehensive policy on the other hand do offer private hospital cover, but are also significantly higher in price as well. If your looking for private hospital cover at a budget price then Frank may be worth considering although it should be noted that a hospital excess exists unlike HIF. In addition to the fact that HIF’s essential cover will not cover you for private hospital admissions, it also won’t guarantee you to have a private room. While you may get lucky and have a room with no other patients, rooms may have as many as five other patients (called shared room). If you want a private room you will need to purchase their top cover (comprehensive working visa policy). HIF has one of the lowest maximum thresholds for repatriation. This means that if you (or a family member covered in the policy) is terminally ill or suffers from a substantial life-altering illness/injury, HIF will pay up to $4,000 towards the costs of returning home (based on their Essential cover). This area is rarely claimed on for 457 visa holders so a lower threshold shouldn’t be a great concern. HIF covers working visa holders up to the age of 65. Customers aged 65 and over are required to purchase HIF’s top hospital & medical insurance product “Visitor Advantage” which starts from just over $235 a month. If your looking for a budget option and are over 65 you may want to consider other fund options. Who Should Consider HIF 457 Health Insurance? The fund will not suit individuals or families that only want to be treated in a private hospital as a private patient for which Frank may be more suitable. As mentioned earlier, HIF is a ‘not for profit’ health fund so that fact it doesn’t need to pay their shareholders and the age restrictions it has in place are key reasons why they can offer one of the cheapest 457 visa health insurance cover in Australia. This HIF 457 visa health insurance review was completed by editors on the 17/07/2016 based on a 457 health insurance comparison table finalised after the most recent 2015 price increases. The 457 health insurance came from the Australian health insurance companies websites with no use of automation or computer generated information. As health funds may change policy prices or features without notice, overseas visitors cannot purchase from this website, rather they are sent to the providers website directly. This ensures they have the chance to view the up-to-date policy documents and verify the indicative information shown on this website. If you find any information on this HIF 457 visa health insurance review that needs to be updated or refreshed (or any other issue on the website), please use our contact form and the authors will make prompt changes. Please feel free also to leave a review on reviewcentre.com or trustpilot.com as we appreciate your support. HIF is rated 3.3 stars by 52 customers. Australia's Leading 457 visa comparison website, 457visacompared. Copyright 2018, IO Digital Pty Ltd. All Rights Reserved.